Question - What do you mean by the term 'competitors' in marketing? How to identify key competitors in marketing, and how to analyze them? In this competitive world there is no business that operates in isolation, there are many businesses that are marketing products similar to or substitute of products you are marketing. These organizations are your rivals and you have to compete with your rivals. 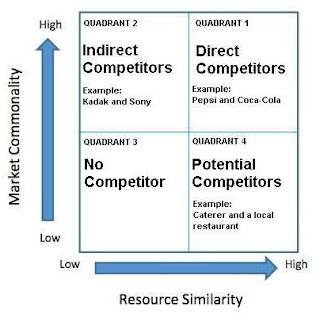 Business competition is the rivalry of two or more businesses that target the same customers, for example Coca-Cola and Pepsi, or McDonald's and Burger King. Business organizations to be successful in long run have to identify their competitors and analyze their strengths and weaknesses to defeat them. Competitor is a person or an organization against whom other person or organization is competing. In business, competitor is a business organization or a company operating in the same industry or a similar industry which offers a similar product or service. For example - Wal-Mart and Target are big players in Retail chain industry, they both are competitor of each other. The presence of competitors in an industry means consumers have more alternatives to choose from, it forces competitors to reduce prices of their products or services to grab the maximum share in the market. In the process of developing a successful marketing strategy, the first step is to identify the key competitors in your market. Competitor identification is important to increase managerial awareness of competitive threats and opportunities. Identification of key competitors is necessary to gain competitive advantage by offering your customers a greater value than the competitors. Not only current competitors are required to be identified, but future competitors are also to be anticipated. Brand Competitors - Such type of competitors are those who market exactly similar products, at similar price, and also to the same customers. For example, Pepsi and Coca-Cola. Product Competitors - Such type of competitors are those who market similar products, but with different features and benefits, and at different prices. For example, Pepsi and Maaza (fruit drink). Total Budget Competitors - Such type of competitors are those who market different products, but competing for the same financial resources of the customers. For example, Pepsi and Potato-chips. We use Peteraf and Bergen (2001) model for the identification and classification of competitive set. 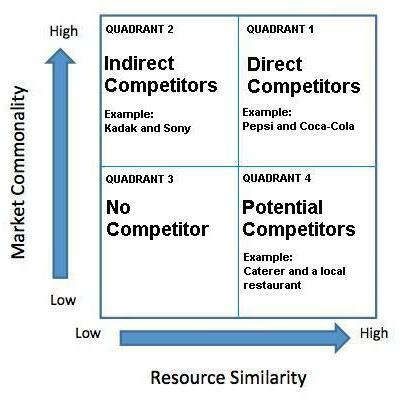 By the use of this model we sort competitors under two categories - Market Commonality and Resource Similarity. We classified candidate competitors on the basis of their resource endowments and the market needs served. Under Market Commonality, we sort competitors on the basis of the degree to which they serve market needs similar to the focal firm. Under Resource Similarity, we sort competitors on the basis of the degree to which their resource endowment is similar to that of the focal firm in terms of type and composition. To map the competitive field of a focal firm we have to locate candidate competitors on the graph. On the x-axis we display Resource Similarity as an increasing function. On y-axis we display Market Commonality as an increasing function. Firm that scores high in both Resource Similarity and Market Commonality is one that serves same market needs with the use of same type of resources as the focal firm. Such firm are found in the Quadrant 1 of the graph. These firms are the direct competitors of the focal firm. Example of such firm can be Coca-Cola if Pepsi is the focal firm. Firm that scores high in Resource Similarity and low in Market Commonality is one that uses same resources as the focal firm, but serves different market needs. Such firms are found in the Quadrant 4 of the graph. These firms are the potential competitors of the focal firm. Example of such firm can be a caterer and a local restaurant. Both uses almost similar resources like chefs, kitchen equipment, etc., but their market is different, caterer serves party foods and dinners for large functions, whereas restaurant serves to individuals and small groups. Firm that scores high in Market Commonality and low in Resource Similarity is one that serves same market needs as the focal firm, but with the use of different resources. Such firms are found in the Quadrant 2 of the graph. These firms are the indirect competitors or substitutes. They satisfies similar needs with the use of different resource or technology. For example - Kodak and Sony. Camera may be used to take picture with film based technology using mechanical capabilities or similar picture can be taken using camera based on digital technology. Kodak is a film based technology camera uses mechanical capabilities, whereas Sony is digital technology based camera uses electronic capabilities. Firm that scores low on both dimensions is one that serves different market and uses different resources than the focal firm. Such firms are entirely outside the competitive set at present, although this could change in future as the firms change their positions. Such firms are found in the Quadrant 3 of the graph. These firms are not the competitors of the focal firm. Competitor analysis helps an organization to identify opportunities for and threats to the organization from the competitive industrial environment. Competitor analysis is an assessment of the strengths and weaknesses of current and potential competitors. It is an essential component of corporate strategy; while formulating organization's strategy, managers must consider the competitor organisations' strategies. Competitor Analysis can be defined as the analysis of data and information about competitors to generate intelligence that is useful in strategic decision making.